Made from drop forged, heat treated chrome alloy steel material with baked enamel finish and heavy duty hex shank. Made from drop forged, heat treated chrome alloy steel material with baked enamel finish and heavy duty hex shank. Made from drop forged, heat treated chrome alloy steel material with baked enamel finish and heavy duty hex shank. Made from drop forged, heat treated chrome alloy steel material with baked enamel finish and heavy duty hex shank. Made from heat treated, high carbon American steel with a target head that reduces spalling and mushrooming. Used for cutting, shaping and removing metal softer than the cutting edge such as cast iron, wrought iron, steel, bronze and copper. Made of heat treated high carbon American steel. Features precision ground point for marking accurate hole starting easier. Use on metals softer than their point. Made of heat treated high carbon tough American steel that's polished and tapered. Used for marking scribe work pieces and layout work, these sharp polished points aid in accuracy. Use on metals softer than their points. Made of fully hardened, precision-milled steel with long, beveled tip for easy nail head alignment, grip is slip-resistant and ribbed to absorb shock, improving precision. Long length enables user to set nails in hard-to-reach areas. Made of fully hardened, precision-milled steel with long, beveled tip for easy nail head alignment, grip is slip-resistant and ribbed to absorb shock, improving precision. Long length enables user to set nails in hard-to-reach areas. Made of fully hardened, precision-milled steel with long, beveled tip for easy nail head alignment, grip is slip-resistant and ribbed to absorb shock, improving precision. Long length enables user to set nails in hard-to-reach areas. Made of heat treated high carbon tough American steel that's polished and tapered. Used for marking scribe work pieces and layout work, these sharp polished points aid in accuracy. Use on metals softer than their points. Made of heat treated high carbon American steel. Features precision ground point for marking accurate hole starting easier. Use on metals softer than their point. Made from heat treated, high carbon American steel with a target head that reduces spalling and mushrooming. Used for cutting, shaping and removing metal softer than the cutting edge such as cast iron, wrought iron, steel, bronze and copper. Made of heat treated high carbon tough American steel that's polished and tapered. Used for marking scribe work pieces and layout work, these sharp polished points aid in accuracy. Use on metals softer than their points. Machined to exacting standards from heat treated, high carbon American steel. 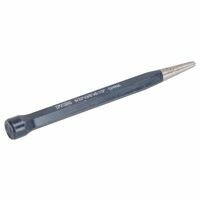 Has a wide variety of uses in driving and removing such things as pins and keys; after initial removal by a machine punch or starter. Use a pin punch one size smaller than the pin being driven to prevent damage to the side walls containing the pin. Made of heat treated carbon steel blade with a square plastic handle. Made from chrome alloy steel material that is drop forged and heat treated. Baked enamel finish Heavy duty, hex shank. Made from heat treated, high carbon American steel with a target head that reduces spalling and mushrooming. Used for cutting, shaping and removing metal softer than the cutting edge such as cast iron, wrought iron, steel, bronze and copper. Made from heat treated, high carbon American steel with a target head that reduces spalling and mushrooming. Used for cutting, shaping and removing metal softer than the cutting edge such as cast iron, wrought iron, steel, bronze and copper. Machined to exacting standards from heat treated, high carbon American steel. Has a wide variety of uses in driving and removing such things as pins and keys; after initial removal by a machine punch or starter. Use a pin punch one size smaller than the pin being driven to prevent damage to the side walls containing the pin. Machined to exacting standards from heat treated, high carbon American steel. Has a wide variety of uses in driving and removing such things as pins and keys; after initial removal by a machine punch or starter. Use a pin punch one size smaller than the pin being driven to prevent damage to the side walls containing the pin. Made of heat treated high carbon American steel. Features precision ground point for marking accurate hole starting easier. Use on metals softer than their point. Made with tempered steel and heat treated for increased durability. Able to withstand a bending momentum of 310 in-lbs with a high-visibility. Powder coated finish. Used to cut or shape wrought iron, cast Iron, steel, brass, bronze, copper, aluminum, nuts and rivets. Made from drop forged, heat treated chrome alloy steel material with baked enamel finish and heavy duty hex shank. Used to cut or shape wrought iron, cast Iron, steel, brass, bronze, copper, aluminum, nuts and rivets. Machined to exacting standards from heat treated, high carbon American steel. Has a wide variety of uses in driving and removing such things as pins and keys; after initial removal by a machine punch or starter. Use a pin punch one size smaller than the pin being driven to prevent damage to the side walls containing the pin.